Nemaguard peach rootstock has been a mainstay in the almond and stone fruit industry for more than 50 years for its resistance to southern root-knot nematodes. Hansen 536, a peach-almond hybrid, has a similar reputation. So, last year when a Merced County, CA, grower noticed stunted growth in a two-year-old almond planting on Hansen 536 rootstock, he got worried. With the assistance of David Doll, then University of California Cooperative Extension (UCCE) Nut Crop Pomology Farm Advisor in Merced County, the young planting on Hansen 536 and an eight- or nine-year-old almond planting on Nemaguard were examined. 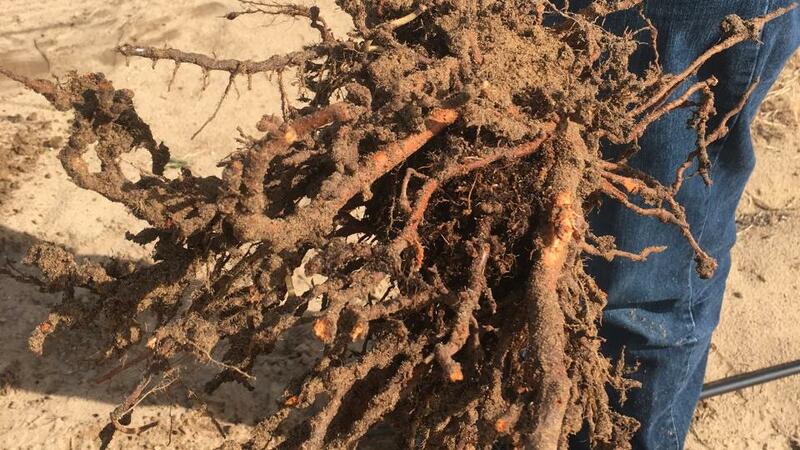 Excavated roots from affected trees showed signs of galling typical for root-knot nematodes. 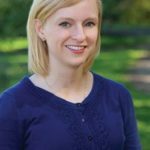 Doll sought the assistance of Dr. Andreas Westphal, Associate UCCE Specialist and Associate Nematologist, to help determine the identity of the nematode. With the help of the state nematologists of the California Department of Food and Agriculture (CDFA), Dr. John Chitambar and Dr. Sergei Subbotin, peach root-knot nematode (Meloidogyne floridensis) was identified. About a month later, peach root-knot nematode was discovered in Kern County. This nematode was originally found on peaches in Florida in the 1960s, but the finds in Merced and Kern Counties were the first official records in California. Mohammad Yaghmour, UCCE Area Orchards System Advisor for Kern County, attributes the discovery in Kern County to the keen eye of his grower. “They saw stunting in the trees and when they looked at the roots, they found that the roots had a lot of galls,” Yaghmour says. Southern root-knot nematodes are common in California. Rootstocks such as Nemaguard, Marianna 2624, and Myrobalan 29C have been resistant to southern root-knot nematodes for years. The main risk with peach-root knot nematode is the ability of the nematode to overcome resistance in these and peach-almond hybrid rootstocks. While this sounds very alarming, Westphal, encourages growers to take a deep breath. It’s very early into the detection of this nematode, and there’s just not a lot of information about how widespread the nematode is. The detections were a significant distance apart in Merced and Kern Counties, one to the center and the other to the south of the San Joaquin Valley. That begs the question of what the peach root-knot nematode’s status is in the area in between. Westphal suggests the nematode may not be a recent introduction because there are data showing that the Merced orchard, prior to this young, heavily damaged planting, was also struggling. Planting the new young, and thus potentially more vulnerable, trees into such soil likely exacerbated the problem making it damaging and visible. This nematode may not be an immediate risk, but it is important to be alert. Peach root-knot nematode is noted as “a quarantine-actionable pest.” It is good to find help with your local farm advisor and folks at UC and CDFA. It is also important to involve your respective county agricultural commissioner if your suspected sites are truly infested with this nematode. There is more information on this pest available at the UC IPM website. 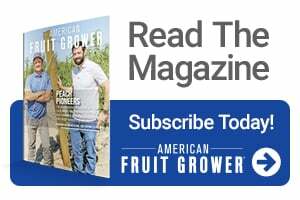 Both Yaghmour and Westphal encourage growers to scout their orchards. Symptoms to look for are stunted or uneven growth, low production, and galls on the roots themselves, especially in rootstocks that are believed to be southern root-knot nematode resistant, such as Nemaguard, Mariana 2624, Myrobalan 29C, and Hansen 536. Yaghmour says the most important thing is to properly identify the pest. “It’s worth it to reach out to their local farm advisor and try to investigate further what’s going on,” he says.